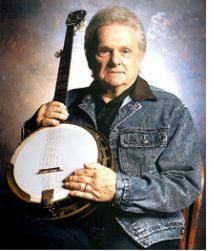 Clintwood, VA -- The Ralph Stanley Museum & Traditional Mountain Music Center will host Dr. Ralph Stanley's 85th Birthday Dinner and Fund Raiser at Heartwood at 6:00PM on Saturday, February 18, 2012 in Abingdon, VA. Heartwood is Southwest Virginia's Artisan Gateway, situated off Interste 81 at exit 14. Come and be with us to celebrate bluegrass music legend Dr. Stanley's birthday with Dr. Stanley himself. A first-class buffet-style dinner will be served and much more at this once-in-a-lifetime event! Tickets to the dinner are priced at $100 per plate, and guests may purchase them by calling the Museum & Center at 276-926-8550. The Museum & Center presents this special birthday event each year in celebration of Dr. Stanley's life and work. With a career spanning 65 years in the music business, Ralph Stanley has made an indelible mark upon the music industry. From old-time to bluegrass to country to gospel, Dr. Stanley has influenced countless artists and continues to break new ground in the industry. To celebrate his accomplishments, previous events have featured such well-known performers as Alison Krauss & Dan Tyminski, Porter Wagoner, Larry Sparks, Jim Lauderdale, Marty Raybon, Judy Marshall, Stella Parton, Rebecca Lynn Howard, Ricky Skaggs and more! This annual event also serves as an important fundraiser for the Museum & Center to ensure that regional music will be an important part of our area in the years to come. All proceeds from this dinner will be used to support the Ralph Stanley Museum & Traditional Mountain Music Center's operating and programming needs. No proceeds from the dinner will benefit Dr. Ralph Stanley and family. A portion of the ticket price may be tax-deductible. The Ralph Stanley Museum & Traditional Mountain Music Center is a state-of-the-art music museum that opened its doors in October of 2004. Located on Main St. in Clintwood, VA, the Museum houses exhibits and artifacts from Ralph Stanley's life and career, the Stanley Brothers, and the traditional mountain music of Dickenson County and southwestern Virginia. The RSM&TMMC also presents a full lineup of programming each year including the Passing the Pick and Bow Program and concerts throughout the year at our local venue, The Jettie Baker Center. For more information or to order tickets, please call the Museum at 276-926-8550 or 276-926-8383.